Reddish South Station had its last regular passenger service in 1991. The station had fallen into graffiti covered dereliction and most people had forgotten a rail service had ever been in Reddish. The Friends of Reddish South Station were formed in 2007 to improve the station site, and to campaign for a reinstated passenger service, thereby creating ‘The East Manchester Corridor’ linking Stockport to Manchester Victoria, and the Northern Hub. 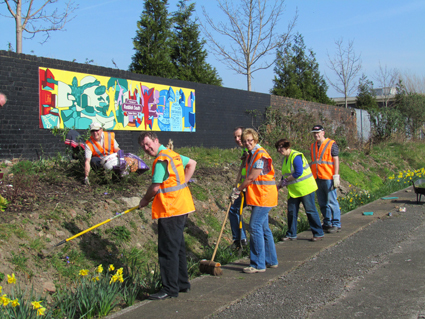 In the last five years we have begun to renovate and landscape the station including the installation in 2011 of the ‘Second Chances’ mural (in collaboration with Arts for Recovery in the Community and Stockport Young Offending Team) and have managed for the last two years to have excursion trains making Reddish South a scheduled stop. Our campaign continues to reopen the line for passenger services.